Wipe your way to crystal clear glass! Ammonia free and safe on tint! BLACKFIRE Glass Cleaner is your new favorite glass cleaner. Formulated to create crystal clear glass (no streaking here! 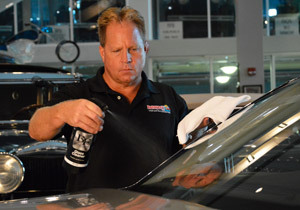 ), and perfectly safe to use on tinted windows, BLACKFIRE Glass Cleaner can be used on more than just your car windows and windshield. Use BLACKFIRE Glass Cleaner on your glass surfaces at home, in your garage, even on your sunglasses! BLACKFIRE Glass Cleaner boasts a powerful, yet gentle, formula that's perfect for heavily contaminated windows. Smoker's Film is a common problem in vehicles who's owners smoke in them. Not only does Smoker's Film impair your vision and cause major contamination - it's just gross! BLACKFIRE Glass Cleaner easily cuts through this layer of gunk for perfect vision again. When cleaning exterior glass, spray BLACKFIRE Glass Cleaner directly onto the surface. Using your Waffle Weave Microfiber Glass Towel, spread the cleaner evenly over the surface. There's only one thing that's perhaps more head-turning than shiny paint - and that's crystal clear, smudge-free glass. BLACKFIRE Glass Cleaner, especially when used with the Waffle Weave Microfiber Glass Towels, gives you just that. Keep a bottle in your trunk for quick clean-ups at car shows and ensure you never have dirty glass again!